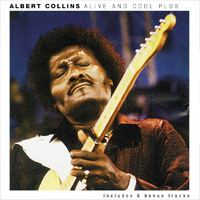 ALBERT COLLINS was a renowned American electric blues guitarist and as a relative of Lightnin’ Hopkins he grew up learning about music and guitar playing. Bob Hite (Canned Heats larger than life singer) and UK entrepreneur Peter Shertser organised gigs for him in the late 60′s. This album was recorded live at Fillmore West, San Francisco, USA in 1969 when on the same bill were Creedence Clearwater Revival and Fleetwood Mac! (Jeremy Spencer from Fleetwood Mac actually recorded this album through the deck) The bonus tracks are his singles from the 1958 to 1962 period. Albert died in 1993 but is fondly remembered and revered as he influenced many artists from Ronnie Wood to Jimmy Page to Gary Moore all of whom he collaborated with. ...the inclusion of half a dozen studio cuts from a decade or so earlier offers a much clearer insight into the unique qualities which made him such an influential figure in blues circles. ...This CD catches him delivering some rather blistering guitar work surrounded by some corking Hammond Organ. This is particularly apparent on the glorious and free-flowing Thaw Out where a mystery keyboard player almost steals the limelight. It has all the live hums and clicks you get at a gig, but the music and the band are rugged, uplifting. There’s a long introductory instrumental, a great version of Mustang Sally, Baby What You Want Me To Do, and among the bonus tracks are Collins favourites such as Freeze, Defrost and Albert’s Alley. Sadly, there’s no information about who’s playing the superb Jimmy Smith -style organ, or the punchy, honking brass - that’s because, as Nick Dalton tells us in the liner notes “Nobody knows …” LSD has a lot to answer for. Still, if you want to hear a fine, skilled bluesman at his guitar-pickin’ peak, this live set is all you could ask for. Apparently no information exists on who actually were a part of Collins' band that night, but in the end it's all about his stinging blues licks, of which there are a multitude here. A good chunk of the songs are instrumental, allowing for plenty of furious interplay between Collins' scalding Fender Telecaster and Hammond organ, with the rhythm section locked in tight underneath all the firepower. Highlights are many, but for pure blues thunder, check out "Thaw Out", "How Blue Can You Get", "Funky", "Deep Freeze", a groove laden and rockin' "Mustang Sally", and a smoldering version of "Backstroke". As an added bonus, Angel Air has included a few studio singles here as well, and though they are not as electric and supercharged as the live cuts, look for some sizzling guitar leads and shuffling rhythms on "Albert's Alley", "Freeze", Defrost", and "Collins Shuffle". As far as vintage live electric blues recordings go, this is as good as it gets.